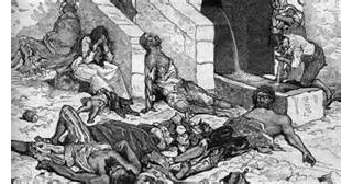 Black Death - The infamous Black Death is usually associated with Europe, but it was, in fact, a worldwide pandemic, and the last time in history that the population of the human race decreased on the earth. It is believed to have begun in China and traveled west via the Silk Road, being transmitted by fleas living on rats. The Mongols were still conquering territory at this time, and their armies unwittingly carried the disease as they traveled. When their soldiers (or opponents) succumbed to it, they would often catapult body parts of corpses over the walls of cities in an attempt to spread the disease to the enemy. It reached the Crimea in Eastern Europe in 1343, and from there traveled to Western Europe along Mediterranean sea routes. Ships were notorious for carrying plague infested rats. The disease peaked in Europe between 1348 and 1350. By the time it was over, it may have killed up to a third of world's population (about 200 million). It did not return to pre-plague levels until the year 1500 (approximately). Its other name is the Bubonic Plague because of the giant welts or lumps called "buboes" that developed in the lymph nodes near the groin, neck and armpits. Contemporary writers referred to it as the "Great Plague" or "Great Pestilence", and many Europeans believed it was God's judgement on them for their sins. And as happened all too often in Europe, Jews were singled out for persecution and blamed for the cause. Also, lepers were sometimes killed as spreaders of the disease (even though the two diseases are separate). Modern analysis of human remains from that era has revealed that the Yersinia Pestis bacterium was responsible for the Black Death. This is the same plague that struck the Byzantine Empire at the time of Justinian (see Justinian & Theodora).